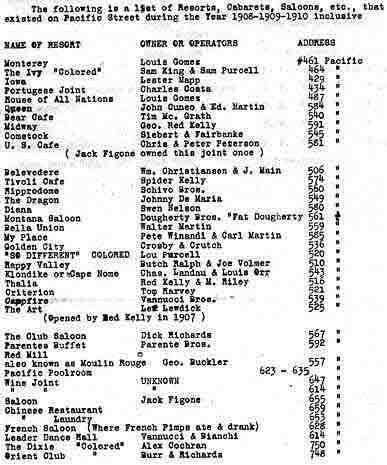 Note that three of the establishments bear the notation colored, to indicate predominently African American entertainment. One of these, The So Different, also known as Purcells, 520 Pacific Street, was visited in 1911 by legendary vaudeville star Sophie Tucker. The Midway, 591 Pacific Street, one of the most famous dives, was demolished in the late 1930s. The two-page list covers three blocks of Pacific Street, heart of the Barbary Coast, as well as establishments on nearby Kearny, Montgomery and Columbus streets. Most of these establishments were driven out of business following enactment of the California Red Light Abatement Act of 1914.